Help Amelie turn a ramshackle hut into the classiest joint on the island as she caters to a variety of guests, keeps her cooks busy and racks up big money in more than 50 fast-paced levels. In a unique twist on time management games, Amelie's Café 2 features a match-3 mini-game that allows you to earn bonuses as you play! Staff and café upgrades will also keep you from going under. 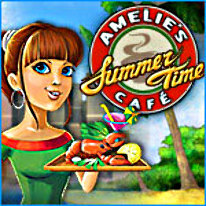 With simple but challenging gameplay, colorful graphics, and two game modes to master, Amelie's Café: Summer Time is your ticket to fun!